HBO has released a trailer for the 2019 Rock & Roll Hall of Fame induction ceremony special. The Rock & Roll Hall of Fame induction ceremony took place on March 29 at the Barclays Center in New York City. Stevie Nicks, The Cure, Janet Jackson, Def Leppard, Roxy Music, The Zombies and Radiohead were inducted. For the first time, the Hall inducted seven nominees instead of the traditional five. 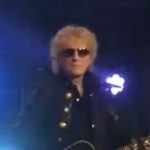 I was always a fan of Ian Hunter and here you can watch the all-star rendition of “All the Young Dudes” featuring Mott the Hoople’s Ian Hunter that concluded the induction ceremony’s festivities.